How to ruin a good jumper…. This week over at Stampotique is ‘Splat’ and the thought process to my project started last week when I went out for coffee with a friend. On returning home I sat down to ‘fiddle’ with a project I was in the middle of. – you know how it is – you get caught up in the moment and before you know it your up to your elbows in glue and paint! Yes you got it – at the time I had my NEW jumper on and true to form for all you crafters, it started with a mark on the sleeve then as I’m cleaning that off, I noticed another mark on the front. I really try to get changed before I do any crafts – but sometimes my eagerness gets the better of me – which I’m sure you all can associate with. 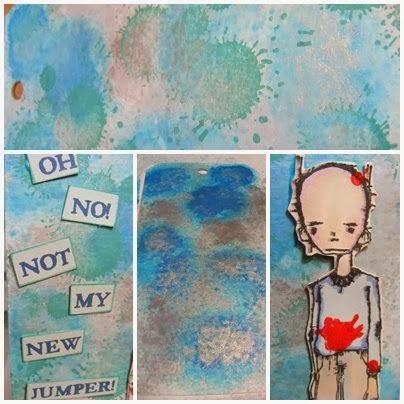 The background was made with spritzing cosmic shimmer sprays, drying that off then adding a Paper Artsy ‘splodge’ stamp. Oliver was happy to be stamped and splodged! and the words were printed on my computer and cut out. ← Here’s lookin’ at ya…. I know what you mean, I always craft in my best clothes and get paint on them ! I love your tag though. Amazing what inspires us to make things ! Been there; done that! I thought this was so funny, until I read the fine print and learned about your jumper! Bummer! Wonderful project – wonderful story. Well not, but it's one of those "been there, done that". TFS. Oh yes!! I've done this many times too!! Gorgeous tag. Thanks for joining us again at Stampotique.